Improve your collection rate using text messages. Text messaging allows you to communicate with debtors quickly and economically. It is faster and more reliable than email. And people pay more attention to a text than an email. It is especially useful to remind debtors of an upcoming payment date when they are on a payment plan schedule. Our system also lets you program actions to specific responses to text messages. For example, if the debtor replies with the word PAY, it can activate a workflow rule that performs an ACH debit. A reply of CALL ME can create a call task for the collector to call the debtor. ICCO has partnered with MessageMedia, a global SMS provider, to integrate text messaging functionality into CollectPlus. For example, the Debtor screen has a simple one-click access to text messaging. You can predefine your own text message templates, that your reps can use. 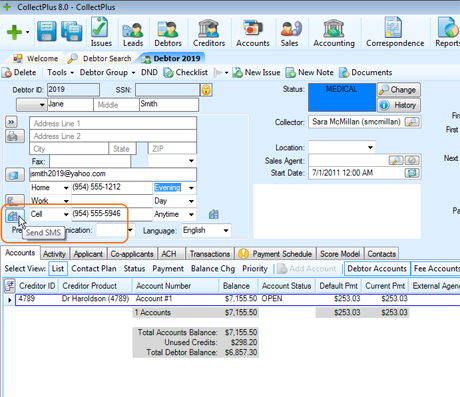 Those templates can have dynamic fields such as the amount due, and the due date. In addition, CollectPlus lets you do batches of text messages to a subset of debtors. For instance, a payment reminder text message could be sent to all debtors with a payment due date of tomorrow. Payment reminders increase your chances of collecting your debt faster. The possibilities are endless, and CollectPlus is flexible enough to accommodate them.